Power modules for processor boards are highly efficient DC/DC converters designed to accept various voltage inputs without wasting energy. They have 2 outputs: 3.3V and 5V, each able to deliver at least 1.5A. The 3.3V output is sized to power an Xscale® board plus Ethernet, an LCD and an auxiliary board consuming several hundreds mA. The 5V output is designed to deliver 2x500mA for USB host ports and extra 500mA for other peripheral. 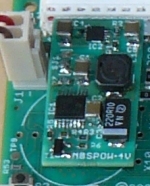 Some models have a 5V shutdown input to disable the 5V converter if it is not necessary (no USB device for example). 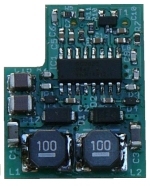 Power modules plug is a FCI Conan® 15 pins connector. It is polarized to prevent mismating. 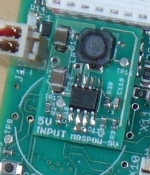 The 5V output is hardwired with the input. * US$ prices subject to change according to exchange rate variations.